Jérémie Gilbert is Professor of Human Rights Law, he joined the Roehampton Law School in June 2017. His main area of research is on international human rights law, and more particularly the rights of minorities and indigenous peoples. He has extensively published on the rights of indigenous peoples, looking in particular at their right to land and natural resources. 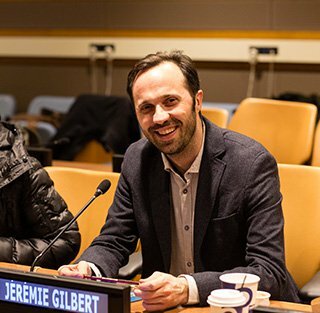 Jérémie has worked with several indigenous communities across the globe and regularly serves as a consultant for several international organisations and non-governmental organisations supporting indigenous peoples’ rights. As a legal expert, he has been involved in providing legal briefs, expert opinions and carrying out evidence gathering in several cases involving indigenous peoples’ land rights across the globe. Previously, Jérémie was a Professor of International and Comparative Law at the University of East London, a Senior Lecturer in Law at Middlesex University, a Lecturer in Human Rights at the Transitional Justice Institute (University of Ulster) and a teaching fellow at the European Masters in Human Rights and Democratisation (Venice). Beforehand he worked for different NGOs such as the South Asia Human Rights Documentation Centre in New Delhi and Greenpeace both France and Canada. PhD in International Law [2001-2004]: Irish Centre for Human Rights, National University of Ireland, Galway. LLM (masters) in Human Rights [2000-2001]; Irish Centre for Human Rights, National University of Ireland, Galway (Ireland). Jérémie has served as a consultant for several international organisations and non-governemental organisations. He was one of the invited independent experts for United Nations Expert Seminar on Treaties and other arrangements between States and Indigenous Peoples (2006), and has served as a consultant for the Expert Mechanism on the Rights of Indigenous Peoples (2015). He regularly works with non-governmental organisations supporting indigenous peoples’ rights. He was the vice-chair of the International Work Group for Indigenous Affairs (IWGIA) international board (2009-2015). Les Pygmées et la Justice : Vers un juridicisation accrue des litiges ?